"Follow me down the rabbit hole…!" RLJE Film has released the full-length trailer for a very twisted, crazy cool, super stylish new assassins film called Terminal, formerly known as End of the Line in production. We previewed a teaser last week, but this full trailer is a must see, this looks unlike anything else this year. The film is the feature debut of director Vaughn Stein, and it stars Margot Robbie, as well as Simon Pegg, Mike Myers, Max Irons, and Dexter Fletcher. I can't really paraphrase this since it's just perfect, so here's the plot straight up: "Terminal follows two assassins with a sinister mission, a fatally ill teacher, an enigmatic janitor and a waitress with a double life. Murderous consequences unravel as their lives meet at the hands of a criminal mastermind wanting revenge." Damn this looks like a cinematic delight. See below. You can still watch the short teaser trailer for Stein's Terminal here, to see a different introduction to this. In the dark heart of a sprawling, anonymous city, Terminal follows the twisting tales of two assassins carrying out a sinister mission, a teacher battling a fatal illness, an enigmatic janitor and a curious waitress leading a dangerous double life. Murderous consequences unravel in the dead of night as their lives all intertwine at the hands of a mysterious criminal mastermind hell-bent on revenge. 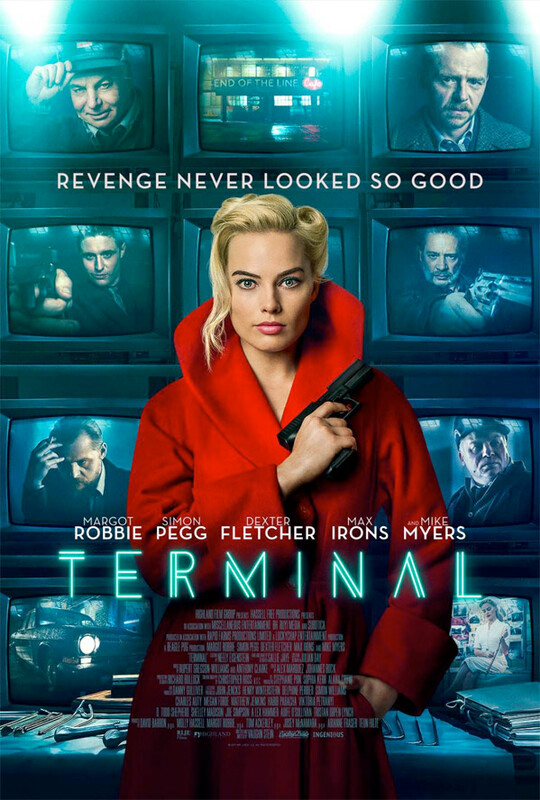 Terminal is both written and directed by filmmaker Vaughn Stein, making his feature directorial debut after working for over a decade as an assistant director in Hollywood. The film has not premiered at any film festivals yet. RLJE will release Stein's Terminal in select theaters starting May 11th this summer. Who's down for this?